I have been checking out local markets and trade shows in recent weeks. "Why?" you ask ...... Well, I have taken the plunge, taken a leave of absence from my job, and decided to turn Patch Andi into some kind of business. I still need to decide on what kind of business to do and I would love your suggestions and words of wisdom and experience and advice in general. (There may be other crafters involved in this business but nothing set in concrete yet). 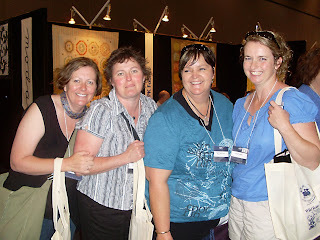 One of the shows I went to was the Australian Quilt Market. I had a ball meeting loads of fellow bloggers. Here I am with Rosie and Melly (well half of her anyway). And with the lovely and oh-so-talented Kellie. Here are Annie, Jodie, Kerri and Julie. 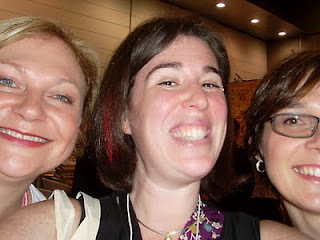 And me with Karen and (half of) Rita. And Corrie and Julie having a gasbag. I've said it before but I'll say it again: I so love this new community of crafters that I have met online and occasionally have the chance to meet in person. It was so lovely meeting and catching up with you all. It makes me feel so supported in my new adventure. I don't think I could have taken this step if not for blogging and the wonderful community I have entered as a result. It was great catching up with you Andi. Good luck with your new venture. I have no ideas or words of advice, but I do want to wish you all the very best for your new endeavour. You have so much talent and enthusiasm, I know that whatever you do, it will be a great success. Congratulations! Good for you - how exciting!! Wishing you all the best of luck!! Congratulations Andi on making the leap. 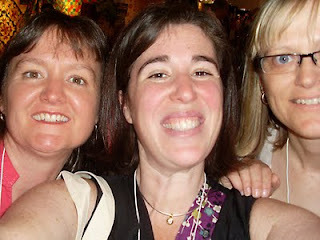 Sounds like the quilt market was a marvellous social even - I have fun (and fabric) envy! This sounds so exiting, Andi! Best of luck with this new adventure!! 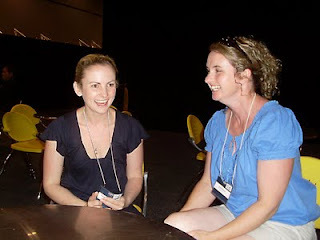 Blogging, sharing and growing - they all go together, don't they? Andi, Please keep me in the loop . Whatever you do is going to be fabulous - I just know that. You are an amazing woman. I have a bit of a craft -crush on you .....hope thats ok! Great to spend time with you on Saturday Andi. We had some fun didn't we! You go girl! I'm sure what ever it is you do will be completely fabulous - and pink and red of course!!! Oh that's great ! Congratulations ! Very, very exciting, Andi! Best wishes on your endeavor!! Congratulations! Good luck on your new venture. Congratulations Andi! Big and bright things to come - I'll be on standby watching! gosh I had a good day!!!!!! So lovely to meet you and so many nice people. I just left feeling all warm and fuzzy that everyone was so gorgeously friendly and welcoming!!!! And you got great pics...I think I was in the business zone of just ordering and getting on with it! I think a trip to the trade show would make anyone go into business! ok here is my 2 cents...I'm always getting asked about classes and you can find local community centres or run it from your kitchen table. And what about patterns and kits all made up so people can buy them and make them all up and then you can combine the two. Do a market or two since melbourne is so lucky to have so many handmade markets with your quilts and kits, patterns etc. phew what do you think! have I exhausted all options! go for it! makes a huge difference when you do something you love! WOW ... Andi this sounds so interesting! Wishing you the best for it all! Go for it! Congratulations! I hope is goes really well for you. You are doing what so many of us dream of!! Congratulations - good luck with your new venture. I think it's great news and a wonderful idea. It will be what you make it - just have fun. Ver peeved that I was sick on Saturday and missed the AQM as well as an afternoon blogmeet. I did kiddie "cwaft activities" at home and felt sorry for myself. I meant "very" peeved. Or very VERY peeved. Looks like it was fun and it would have been lovely to meet you. Yay for you my dear friend!!!! You will be terrific!!! Now as for that photo of me ..... eeeeekkkkkk!!!!!! Was so good to see you!!!! Good luck on your new adventure! With your talent and enthusiasm I'm sure you will do well! Congratulations!!! Can't wait to see what your creative venture is. You have so much talent Andi ... I'm sure whatever you do will be a great success. Hooray! Congratulations on taking the big step, I'm sure it will be amazing and you'll never look back. 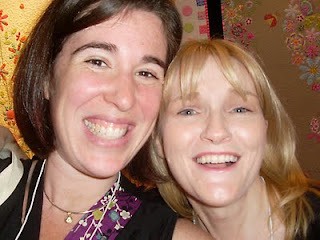 Sooo jealous that you went to the quilting show I would have loved to be there. Here here for crafty businesses. You go girl. I hope your new venture is a real success. I went to the quilt market didn't think to mention it in any of my post. It would have been nice to meet some other bloggers. You didn't forget to take pictures like me!!!! Sprung gas bagging, not surprises there was so much to do and talk about and so little time. Good luck with your new venture whatever it may be!!!! This is so exciting! I stumbled upon your blog from another and I dream of doing this exact thing. I'm not at a point in my life to do so yet. I've bookmarked you and can't wait to see how it goes though! congrats!!! you'll be great at whatever direction you pick your business to go!